The UAE will experience a "significant growth" in international students choosing the country for their higher education, thanks to the new five- and ten-year residency visa extension that was announced on Sunday, a KHDA official has said (read detailed report here). His Highness Sheikh Mohammed bin Rashid Al Maktoum, Vice-President and Prime Minister of the UAE and Ruler of Dubai, had made the announcement on Sunday. Students that are performing exceptionally well will be eligible for a 10-year residency, while other students can get a five-year visa and dependents will receive a visa extension to help them get started on their career after graduating. Specialists, such as doctors and engineers, will also be eligible for a 10-year residency visa. "Dubai is a popular education destination for international students and extended visas will further enhance our position as a hub for higher education. We are expecting a significant growth in the number of students coming to study in UAE and this decision will not just benefit the UAE economy but also enable greater opportunities for higher education institutions and students," Dr Warren Fox, chief of higher education at Knowledge and Human Development Authority (KHDA) said. Universities in the UAE have also welcomed the new move, saying that it will give a huge push to the higher education sector in the country, as well as help students get started on their careers without the worry of renewing their visas each year. Dr Cedwyn Fernandes, director and pro vice-chancellor at Middlesex University Dubai, said the visa extension for students will give the higher education sector in the UAE a much-needed boost. "Dubai is one of the top five transnational education markets in the world and attracts a large number of students who come to the UAE specifically to study. The long-term visa of five years and 10 years will ease the anxieties of potential students as to whether their visa will be renewed every year and also save them the hassle and expense of visa renewal processes," Dr Fernandes said. "Allowing students to extend their visa after graduation will be a game changer as students would now be assured that they have a reasonable amount of time to find themselves a job. As western countries make student visa issuance more difficult, the UAE is taking the right steps in easing student visa rules and also providing access to world class universities based in the UAE. 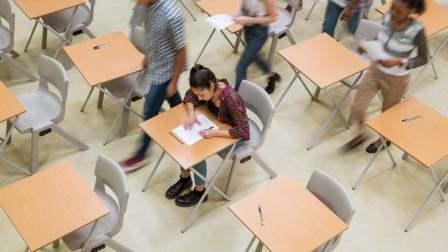 I expect that due to these measures the number of students coming to the UAE to study will increase by 10 per cent in the first year and go as high as 50 per cent increase in five years' time." Andy Pacino, the training and learning coordinator at Murdoch University Dubai, believes the visa extension will bring the best students to the country. "The job market for new graduates hasn't always been easy to access, so the new the five- and 10-year student visas proposals can only offer more promise for employment for fresh graduates. It is a huge boost for the region's education institutes," he said. "Investment is being ploughed into the region at an increasing rate, and having the best talent on tap will make it even more appealing for new companies to open up here. Dubai is an attractive option for students as matters currently stand, but the possibility of a 10-year visa will surely bring the best the world has to offer to the region's universities." Dr Fazal Malik, an associate professor at Amity University, said the move is a "remarkable push towards the knowledge economy", which requires high performing professionals in the region. Dr Malik said the visa extension will encourage "brilliant minds" to engage in the UAE. "With the worry of visa expiry taken care of, the students can focus on new ideas and contribute more positively to the local economy supported by a most business friendly ecosystem in the region. I see a wave of happiness among the senior students, especially in engineering fields, who will be looking for work in coming months. This optimism is indispensable for any economy," he said.